Pitfall Planet is a local co-op adventure, perfect for friends and family! The gorgeous graphics, challenging gameplay and abundance of humour and charm make it a perfect fit for the Nintendo Switch and its couch-based co-op gameplay. Players only need one Nintendo Switch to play together as they can use a Joy-Con each! 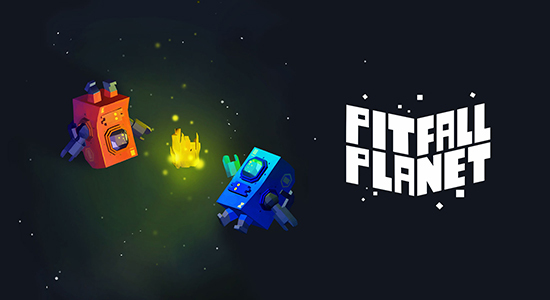 Pitfall Planet is packed full of puzzles to solve, imaginative levels to explore and stars two of the most charismatic and cute robots this side of the galaxy. Whether it's the arid sand of the planet surface, the lava burning bright in volcanic chambers or the freezing ice caves deep below, there is plenty to see and do along the journey to collect the ore scattered in each level, which is vital to repair the damaged spaceship. Using teamwork to solve puzzles is the main goal, but players can hinder their teammate if they so choose - by throwing them into lava, grappling them away from their position or even using them as a shield against bosses! With infinite respawns, it comes down to how patient they are! As if hours of challenging puzzle-based gameplay is not enough, players can then spend their gems upgrading the two protagonists with a range of fancy headwear to make them the best-dressed robots on the planet - perhaps even the galaxy! Pitfall Planet has been lovingly recreated on Nintendo Switch by Abstraction, with the collaboration of original developers Bonfire Games. Pitfall Planet’s rich soundtrack perfectly encapsulates the constant juxtaposition between relaxation and danger when exploring, solving puzzles and battling bosses. Play through a variety of levels with intriguing puzzles and dangerous enemies. Cute robots in a vibrant and distinctive world. Explore a mysterious over world to discover caverns and secrets. Two-player local co-op for hours of couch-based fun!